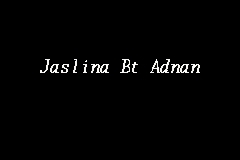 Jaslina Bt Adnan is a lawyer since May 12,1992 currently practicing in Naziman & Co., Kangar branch, Perlis. You may reach Jaslina Bt Adnan at 04-9773001 , 03-9776001. Jaslina Bt Adnan works as a lawyer for more than twenty-years.